Capt. 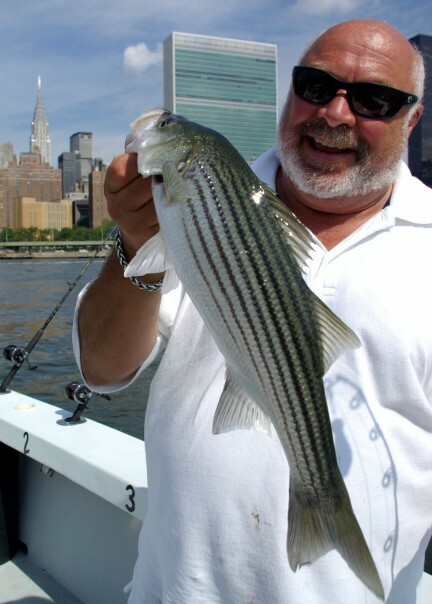 Tony Dilernia with a healthy, NY City striped bass. See more on stripers in Latest News! Established in 1981, New York Sportfishing Federation is a not-for-profit organization recognized as the voice of the recreational fishing community in New York State. Through the dedicated efforts of our volunteers, the Federation works to unite the varied interests of New York’s recreational fishing community, bringing together the views and concerns of all recreational users and business owners throughout the marine district. According to the U.S. Fish and Wildlife Service (2006 survey), there are approximately 291,000 saltwater anglers in New York, 238,000 state residents and another 52,000 out-of-state visitors. 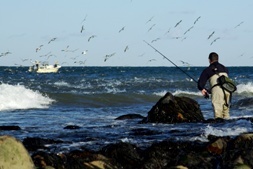 New York ranks 9th among coastal states in overall retail sales in saltwater sportfishing with over $373 million in saltwater tackle sales, with total annual salaries, wages and business earnings said to exceed $220 million. Saltwater anglers fish a total of 3.95 million days in New York according to the USFWS 2006 data, with each angler 16 and older estimated to spend an average of $1,151 each year on sportfishing, with $219 spent on food and lodging, $137 on transportation expenses, and roughly $795 a year directly on fishing equipment and services. The recreational fishing community in New York helps drive the state economy, supporting from 6,400 to 10,600 jobs and generating more than $49 million a year in state and local tax revenue. For over 30 years, New York Sportfishing Federation has represented the collective voice of this community. Members of the New York Sportfishing Federation are dedicated to preserving the marine habitat andmaintaining the bio-diversity of our marine resources, through sound management practices, regulations, and laws, while promoting Sportfishing, educating youngsters on stewardship and education through public awareness. Striper blitz at Montauk, NY keeps casters busy by boat and by beach! New York Sportfishing Federation members are active in issues related to coastal access and conservation. From Montauk to Manhattan, Staten Island to Gardiner’s Island, on across the Sound to Mamaroneck and City Island, New York Sportfishing Federation works to unite the recreational fishing community with a single voice. From bottom fishermen to canyon runners, kayak and cartoppers to surfcasters, New York Sportfishing Federation members represent diverse backgrounds and work in unison to help protect and preserve access for all saltwater anglers. Every year during President’s Day Weekend, New York Sportfishing Federation hosts an annual Forum and Auction bringing together some of the top tackle retailers, outfitters, guides, clubs and organizations from throughout New York under one roof at the Freeport Recreation Center. The ‘Freeport Show’ typically sees over 2,000 anglers through the front door each year, with monies raised going towards a programs designed to support the New York Sportfishing Federation mission, including our Teach A Kid To Fish (TAKTF) program and other worthwhile charitable efforts to promote sportfishing opportunities throughout the region. Go to About Us to learn more about what we do, or check out Latest News to find out about what we’ve been doing to protect your right to sustainably access our public resources. *If you plan or want to attend any of our meetings please contact President Capt. Joe Paradiso at 631-786-8418 .